12 people attended the meeting, called by the RSA (Scotland), to set up the Campaign for a European Republican Socialist Party. 12 people gave their apologies. Those present also belong as individuals to a number of organisations including Assemblies for Democracy, Independent Workers Union – Ireland, Left Unity Party, Radical Independence Campaign, Republican Communist Network, RISE, Scottish Socialist Party, World to Win. 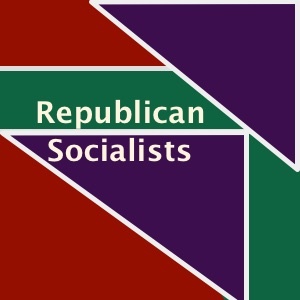 The RCN is affiliated to the Republican Socialist Alliance. Allan Armstrong attended the meeting hosted by the new RSA (North of England) group on the 12th March in Stockport. Steve Freeman, acting RSA convenor, has written the following report. This was a productive with decisions taken which should help us build the RSA in the next year. The RSA was set up in 2013 mainly in England but with some support in Scotland to promote discussion and ideas about republican socialism. We set up an email list now with eighty two members, from the Labour Party, Green Party, Left Unity, Rise and no party. 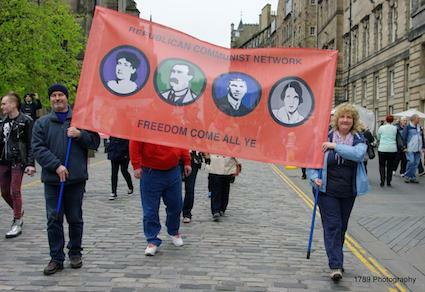 We have been supported by the ‘Republican Communist Network’ (Scotland) and ‘A World to Win’. We have organised some debates and educational events and a ‘London Says Yes’ rally in September 2014. Some of us have worked for republican socialism in Left Unity, the Scottish referendum, RIC and RISE and the general election. In Scotland we have seen RIC and RISE and in England the Corbyn movement has swept all before it. So there has been much change in the political environment since our foundation and this meeting was focused on catching up and looking to the future. We are posting three pieces dealing with the situation in Syria. The first is the emergency motion passed overwhelmingly at the RISE National Conference in Glasgow on December 5th. 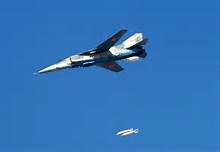 The second was written by the World to Win Editorial Board just after the vote at Westminster to openly extend UK state involvement in the war in Iraq to Syria. The third by Allan Armstrong (RCN and RISE) was written just prior to the Westminster vote, and was included in the E&L special bulletin for the RISE conference. 1. EMERGENCY MOTION ON SYRIA PASSED AT THE RISE CONFERENCE ON DECEMBER 5th. The article below is a follow up from the World to Win blog (see http://www.aworldtowin.net/blog/a-very-capitalist-coup.html), from the one posted after the Greek referendum on July 5th. The humiliation enforced on the people of Greece by the ECB backed by the EU bureaucracy will have a bearing on politics throughout Europe. It remains to be seen how the Syriza government’s capitulation will be received amongst those most affected in Greece. However, it is now abundantly clear that promoting bankers’ coups is European corporate capital’s favoured method of dealing with any challenge to their rule. This provides a wake-up call to socialists of the necessity for our own coordinated international response. The political and economic humiliation heaped upon Greece by the major European capitalist states led by Germany has shocked people around the world. The hashtag #ThisIsACoup trended on Twitter as global cyber-anger reflected what in essence had taken place. Emancipation & Liberation will be posting a series of responses to the new political situation after May 7th. The first comes from Murdo Ritchie (RCN), the second from World to Win. Never have so many nations been divided by a common government. 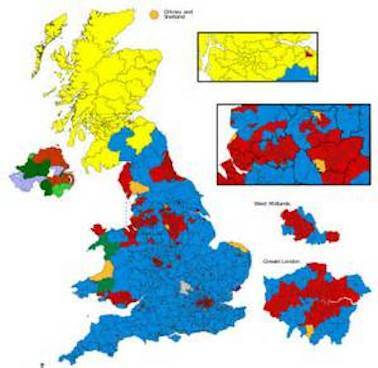 The glaringly obvious result when Scotland voted 56 of its 59 MPs, is similar to Wales where the Labour Party won. The Unionist alliance in Northern Ireland also won, but although this may seem like a continuation of the Tory party it resembles the nationalist parties in their lust for more Westminster cash, even condemning the so-called “bedroom tax”. The Tories won almost the entire South of England removing the Liberal Democrats almost completely from the West Country. Below we are posting an article by Paul Feldman from World to Win on Syriza’s election victory in Greece. This is followed by the leaflet produced by Real Democracy Now (Greece) which was handed out at the Radical Independence Campaign called demonstration at the Scottish Parliament on 14th February. 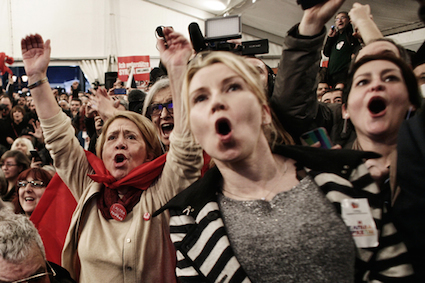 The stunning victory of the anti-austerity Syriza in the Greek general election deepens the existing political crisis in Europe and throws into sharp relief the reactionary policies of Labour and other mainstream parties in the UK. This is the first time since the financial crash of 2007-8 and subsequent state bankruptcy of several countries in the European Union, that an electorate has had a clear choice. Up until now, in Ireland, Spain, Portugal and Greece itself, all the parties contesting for power pledged to observe the harsh terms for bail-outs. Designed to prevent the euro from collapse, the draconian conditions were imposed by the hated Troika – the EU, the European Central Bank and the International Monetary Fund. Now the Greeks have voted against the Troika and its supporting parties and for an end to austerity policies that have all but destroyed the country’s economy, health service and education system. Homelessness, starvation and destitution have become a common feature in Greece.